– Missouri Ave. from S. Clark Blvd. to Market St.
– 100 block of Walnut St.
– 100 block of Wall St.
– 100 block of Spring St.
– 100 block of Mulberry St.
All streets listed will also be designated as No Parking Zones from 7:00 A.M. until streets are opened as well as all city owned property, including but not limited to, the riverbank area and all parking lots under I-65. Residents living in the event area affected by the closures should go to the intersection nearest to their homes and will be allowed entry with proper credentials. The I-65 entrance/exit ramps at Exit 0 are expected to be closed by the Indiana State Police at approximately 7:00 A.M.
As in the past, the City of Jeffersonville prohibits certain items and activities on city property, including city streets, parking lots and the riverbank. 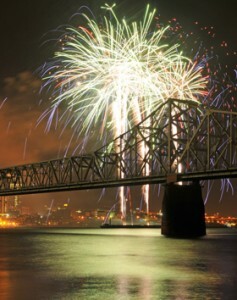 These are regulated by City Ordinance 2009-OR-20 and 2010-OR-1, specifically relating to Thunder Over Louisville, as well as all applicable city, state and federal laws. Prohibited items include alcoholic beverages, weapons, pets, open flames, tents, portable buildings, tarps, skateboards, bicycles, motorized scooters, and golf carts, except those used by police, EMS, city officials, or Kentucky Derby Festival personnel. Please have proof of residency with you. Examples are your driver’s license with proper address, a utility bill with proper name and address or vehicle registration with proper name and address. All guests must be accompanied by the home owner in person or have a Jeffersonville Police Department parking pass. ALL VEHICLES MUST BE PARKED ON PERSONAL PROPERTY. All unauthorized vehicles will be cited and towed at the owner’s expense. Your cooperation and patience is necessary for the safety of all attending and residing within the “Event Area”. Once again the Jeffersonville Police Department wishes to thank you for your continued understanding of this ever growing event.